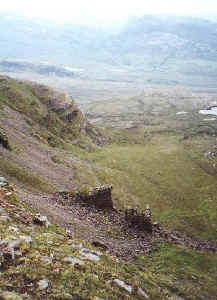 Applecross Walk, Skye, Torridon, River Kishorn, Beinn Bhan. Venture north to the wilderness of Applecross and marvel at the lonely landscape of steep sandstone mountains protected from assault by sweeping coires and giant rocky buttresses. Arguably the most impressive peak in this area is Beinn Bhan, the highest point on the great sandstone plateau of Applecross. It's a bulky mountain ringed by steep cliffs and acres of exposed rock. It misses out on Munro status by just over 60 feet, but the climb is spectacular, breaching the seemingly impenetrable defences to reach a vast open plateau with stunning views to Skye and Torridon. The car park at the start sits on the west side of the bridge over the River Kishorn, as the road turns sharply left. Set off along an obvious path which heads north over open hillside, leaving the River Kishorn behind and curving under the rocky coires of Beinn Bhan. The main path continues north to Loch Gaineamhach, but a narrow path branches off on the left, rising to Lochan Coire na Poite. Don't worry if you lose it, just tramp over the hillside until you reach the tiny lochan which sits below a huge cylindrical castellated buttress. Coire na Poite sits immediately above, two ponds of mountain water hemmed in by a natural rock dam. Don't go up here, but instead climb into the main coire on the right of the cylindrical buttress. The way continues over grassy hillside, almost football pitch flat at one point, following a burn into the coire. A steep but easy scramble up the scree-strewn back wall lifts you on to the summit plateau a kilometre or so north of the summit. Walk south along the cliff top and a gentle gradient leads past a small upland lochan to the summit trig point (896m/2939ft), an excellent viewpoint with open vistas west to Raasay and Skye. From the top, go west and descend a wide boulder field to Bealach nan Arr which sits at 2000 feet and separates Coire nan Arr, to the south, and, to the north, Coire Attadale, known locally as the 'Sanctuary' because of the steep protective walls. It's well graded, but for a final steep section into the base of the col which requires a little gentle scrambling. A path rises out of the bealach on the other side, on to the long north shoulder of Sgurr a Chaorachain (spelt with a 'G' on the OS map). The way is strewn with shattered boulders and large blocks of rock which have to be negotiated, making this a very tiring tramp. A mile from the bealach, take a breather at a tranquil wee lochan before beginning the final short ascent to the first top where a large mast rather spoils the wilderness landscape. Head out along the narrow ridge to reach the top proper (792m/2599ft) and enjoy views south over Loch Kishorn. Below you can see the outline of the former Howard Doris oil fabrication yard with its huge horseshoe-shaped dry dock. The giant concrete Ninian Central platform was built here in the 1970s, pumping millions of pounds into the Wester Ross economy. The deep water facility continued in business, working on other oil and gas contracts, until the late 1980s when the site was cleared. Plans are in hand to re-open the yard for rig de-commissioning work. Return along the ridge to the mast and follow a track down to the Applecross road. Bear south east and descend the twists and turns through Bealach na Ba and let the road guide you back to the start. Map OS Landranger 1:50,000 sheet 24. Start/parking Small car park 500 yards west of Tornapress (grid ref NG 834423), a mile north of Kishorn on the Applecross road. Grading A long day over rough, rocky and remote terrain, suitable for fit, experienced hillwalkers. A serious expedition for properly equipped mountaineers In winter with crampons and ice-axes a must.